Come November and a group of villagers in Bandipora row their boats into Wular Lake to extract water chestnuts which are then supplied to markets in and outside the state, Bilal Handoo reports. Located barely two km from Bandipora town in north Kashmir, the sleepy village of Lankreshipora is one of the principle suppliers of water chestnuts, locally known as Gaer, to the markets across the Kashmir valley. The Lankreshipora village bears a typical rural setting. Paddy fields have been recently harvested and heaps of wheatish grass lies on the roadsides. These days, Asia’s largest freshwater Wular Lake bears a festive look with a large number of boatmen extracting chestnuts from its waters. These boatmen leave their homes in the wee hours, row their boats into the lake and return in the evening with boats loaded with chestnuts. “In some cases, volunteers from neighbouring villages form a group who then board a single boat, venture into the deeper parts of the lake, spend days together there, and come back with a large harvest,” said a young boatman, Yaseen Dar. Bandipora district is the main supplier of water chestnuts to the Kashmir valley. Many families living in Lankreshipora, Kunzpora, Kulhama, Gurer, Saderkot, Baniyar, Bakhchibal, Larapora, Kanipachi, Kunez, Ashtong, Kemai and Zurmanz which lie on the periphery of Bandipora have licenses to take out water chestnuts from the lake but Lankreshipora is the principal supplier. Water chestnuts usually ripen in the month of November. The villagers take out the nuts which are then processed and supplied to the vendors in Kashmir as well as markets outside the state. Known for its edible, medicinal and health values, the water chestnuts are eagerly sought by people in the valley. However, tracing chestnuts in Wular is not a cakewalk. Rather, it is a painful exercise. As I walk into Lankreshipora village, piles of raw water chestnuts are seen lying on the porches of houses. Females, cutting across their age groups, sit in circles and remove the kernels from chestnuts which are then sold to traders. The villagers claim that nearly 80 percent inhabitants are involved extracting chestnuts from Wular to make their living. “Chestnuts are the main source of income for the majority of people living here,” said Ghulam Ahmad Reshi, a father of seven children, who live in Lankreshipora. Reshi, who injured his leg a few months ago in an accident, has left the trade and his wife and five children are now involved in the extraction process. Adjacent to Reshi family in Lankreshipora lives an elderly woman, Mukta. With no male member in the family, her granddaughter, Rifat, is involved in plucking water chestnuts. Since it is the peak of water chestnut season, Rifat visits Wular Lake daily on her boat to collect the nuts. 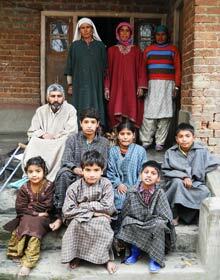 Like Rifat, Adil Reshi, a Class 9 student from the same village, also shoulders his family’s responsibility. After attending school every day, he makes it sure to spend at least two hours to remove kernels from raw chestnuts. “During holidays, I spend more than half of the day before going out to play football with friends,” said Adil while removing kernels from the nuts. A single day sale of the nuts fetches a seller Rs 250 to Rs 300. Since a large number of people are involved in the cultivation of water chestnuts, the collective income touches Rs 3.5 lakh per day. But the income from chestnuts is seasonal. The extraction of chestnuts lasts only four months. By the time March approaches, the thinning of the crop brings the trade to a gradual halt. “At the end of the season, only budding green chestnuts remain in the lake which needs breathing time to grow again. 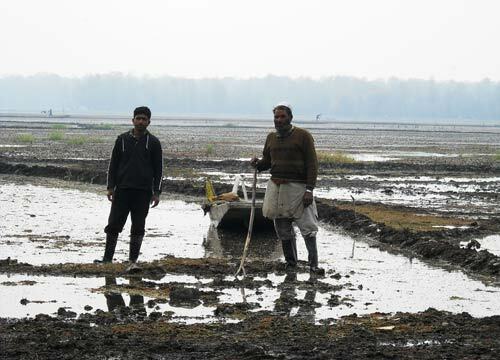 Most cultivators don’t pluck them,” said a boatman, Ghulam Mohammad Dar while collecting chestnuts along with his fellow villagers near the periphery of Wular Lake. Dar has been involved in extracting chestnuts from the last 30 thirty years, “Chestnut industry runs in crores due to the mass participation of people in this town. If the given parameters are taken into account, the gross revenue of Lankreshipora village touches Rs 4 crore at the end of a season,” he says. “It is a free trade practice which runs in crores of rupees. Since it is not registered, therefore the exact figures can’t be predicted,” sitting president of Kashmir Chambers of Commerce and Industry, Abdul Hamid Punjabi, said. “It is mainly the downtrodden section of society which deals with this trade. That is why the government has not registered. In case it is registered, the people involved will have to pay taxes which will become a burden for the community,” he added.